Discover how good and bad note investment deals can go in this latest episode of the DistressedPro.com Professional Podcast Series, and the resources the pros are using to make profitable deals, with less risk. Find out how Adam Adams got started as a note investor, acquiring and repositioning single and multi-family dwellings, and how he is making money, making other people happy, from his laptop, and is loving it. 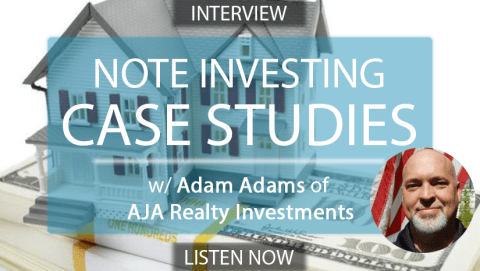 In this episode, Adam Adams of AJA Realty Investments reveals how he fell into note investing and has now created a mobile investment business with multiple partners that operates in multiple states. Adams says he started out with acquiring a Dallas area brewery through his self-directed IRA in 2010. Then out of necessity turned his old home in Houston into a rental property. From there he began investing in apartment buildings, and graduated into notes. Today he is buying and selling dozens of notes, and focuses on non-performing notes on single family homes, C-class commercial multifamily properties, land contracts, and even unsecured debt. Adams reveals that about 40% of deals becoming re-performing notes. Often through working with borrowers who have a deep emotional connection to the property, and giving them a chance to get back on track. The other 60% are typically repositioned and resold. AJA Realty Investments is a veteran owned and operated company in Dallas, TX, and was formed in 2012. Adam Adams has seen the venture flourish, attracting numerous partners along the way. Of course, not every deal is a gem. In the podcast, he reveals two case studies of note deals that have gone very beautifully, and others not so much. On one land contract purchased from a hedge fund for $12k, with a BPO of $80k, inspection after the acquisition revealed a need for $50k in repairs and code issues. So far, he hasn’t even been able to donate the property. On another land contract purchased for $19k, Adams obtained a cash for keys release for $500, and landed a sale on the first day listed with a Realtor at $35k. He’s never even been to the state, much less the property. Sorry, this audio has gone into the vault. See what’s included with a DistressedPro membership.